I picked this record up when it was released in 1991, and while I did like it at the time, I don't think I fully appreciated it. This record is a great slab of early 90's power pop. Great hooks and melody, this and their EP Curiosity and Relief are an incredible collection of ear-worms. Sonically, HBC's have more in common with acts such as Material Issue and Sloan, than they do with Minor Threat or Fugazi, although they seemed to pave the way for later Dischord acts such as Smart Went Crazy, Soccer Team, and Title Tracks. 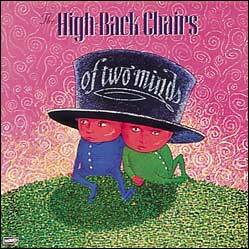 The High Back Chairs first and only LP, released in 1991. This 12" LP comes with a free MP3 download when purchased from Dischord.